The first seal pups of 2019 are swimming with the snorkelers. Cape Fur seal pups are born every November, helpless and unable to swim. They have to rest in the centre of Duiker Island for around 5 months, to suckle from their mothers and grow strong enough to face the wild ocean. The seal pups are born without any blubber, so they can’t handle the cold Atlantic ocean. Their coat is adapted to protect them from the heat of the sun. The strongest pups are now just starting (4th March) to show themselves on our snorkeling trips. These tenacious little seals have fought through swells, heat and massive adults to make it this far in life. Today was the first time that I’ve seen the new cohort of little one’s enter the water and swim with the snorkelers. I only glimpsed 2 individuals, but more will come in the next few weeks. The natural mortality of seal pups on Duiker Island is extremely high, due to the low level of the island and the big swells that wash over it during summer. This image is not great, but it’ s the best one I could get, on the first day the seal pups entered the water. If you’ d like to come see the pups for your self, JOIN US. This little Cape Fur seal pup is the first one to join us at the snorkeling site. 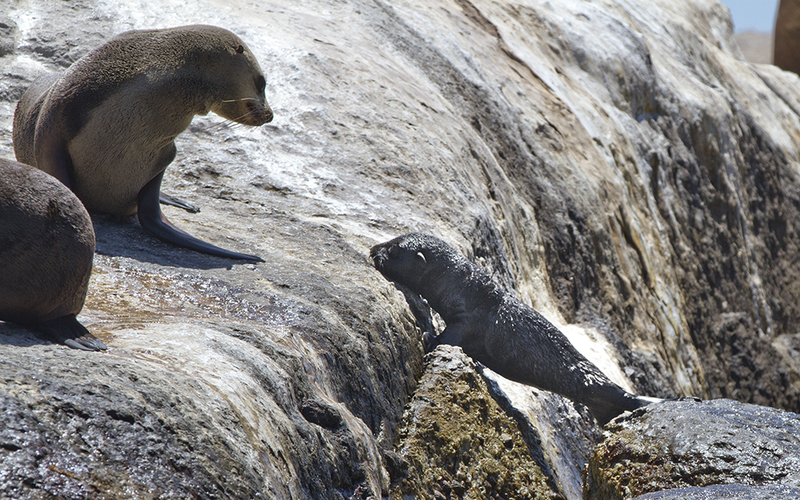 Female Cape Fur seals come ashore in early November each year to give birth and mate. 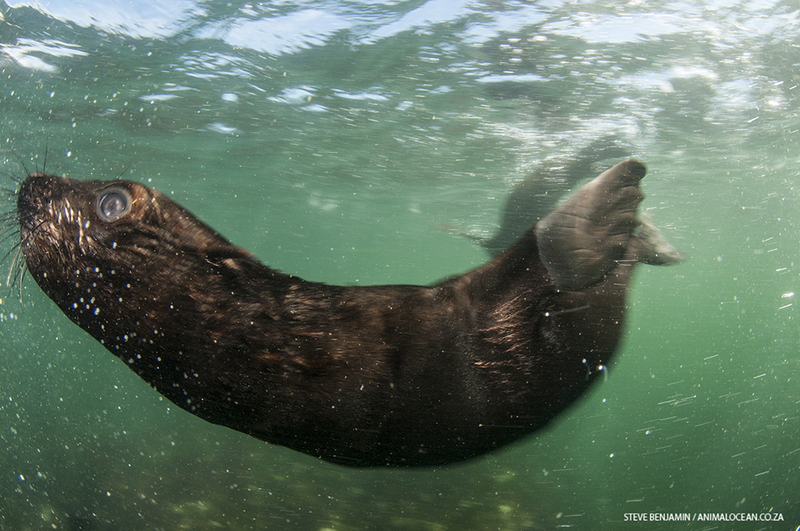 Cape Fur seals have a 9 month gestation period, which is achieved through delayed fertilisation (more here). The pups are born onto the flat rock and no nest or cover is found to protect the pup. the female will stay with the young pup for the first few weeks but will go out to sea to feed for shot periods of time. The pup suckles from the mother for up to a year ! During the first few weeks of life, its important that the pup stays on Duiker Island, as falling into the ocean means certain death. The pups are not strong enough to survive the waves and clod water. Each year we celebrate as our snorkeling area fills with young seal pups. These little new and curious seals have never seen humans before and are interested in you presence in the water. The young pups are small and black in coloration, with a “Flappy” swimming style. The form little groups and maraud around the ocean like a swarm of black puppies. This is a video form our Youtube Channel , showing the first day of 2018’s arrival of seal pups into the water at Duiker Island.